These teachings come from the Anishinaabe people. There are different variations of these medicine wheel teachings; this is only one of them. 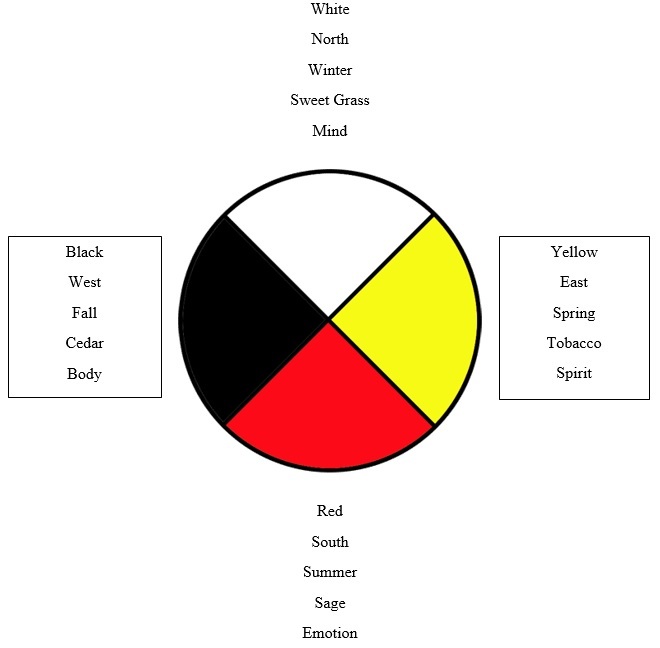 The medicine wheel is a circle because it demonstrates that it is a never-ending cycle. It is continuous. It is further divided into four sections, each with its own distinct colour. Each colour represents the original four races of man that the Creator made. Each section has its own meanings and representations such as the four directions, seasons, and sacred medicines. There are more in depth teachings behind the medicine wheel. I would encourage you to seek a knowledgeable elder or individual within the Anishinaabe culture to share any other teachings with you.